Providing you the best range of digital flame photometer with effective & timely delivery. We are engaged in manufacturing and supplying of flamephoto Meters. This is a measuring device for ascertaining presence of metal ions like calcium, potassium, lithium and sodium in the inorganic chemical compounds. Most flamephoto meters are equipped with sodium or potassium filters. We supply both single and dual chambers flamephoto meters to cater the varying needs of our esteemed clients. 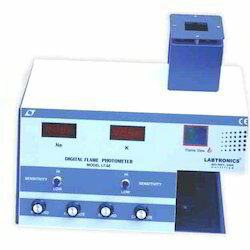 Digital Flame Photometer (Single Channel) with filter (NA K) 3 1/2 digit LED display (PPm)along with compressor and other accessories Ca Li filter can be provided on request. Looking for Flamephoto Meters ?